You might still run into Ryan Gosling, Mark Wahlberg, Christina Hendricks, Tom Hardy, Claire Foy, or Jason Bateman before the year is out! Ryan Gosling, Claire Foy, and Jon Bernthal are still working on The First Man (production code: COLIN). The Neil Armstrong biopic had signs posted at the end of November in Marietta and in Midtown near Georgia Tech. On December 3, the production also shot in Midtown. Four days later, crews were spotted working at Emory Briarcliff, at the old Georgia Mental Health Institute building. On December 13, signs were spotted off of GA 400, off of exit 7B. Filming returned to Emory on the 15th. Tom Hardy’s Spider-Man flick Venom (LOZ) has also made a visible mark on Atlanta this month, shooting downtown near Peachtree Center on November 28. On December 7, crews shot out of Panola Mountain State Park. Most recently, starting on the 13th, the production moved to Fairlie Poplar for filming. Most recently, the movie shot at STK in Midtown on December 19. Venom also stars Jenny Slate and Michelle Williams. Last month, we mentioned that Mile 22 (M22), starring Mark Wahlberg, Lauren Cohan, and John Malkovich, had just begun filming. Now, the action movie, which revolves around a CIA operative and an Indonesian police officer working together against the corruption around them, has been spotted in the wild. Just after our last post, the production blocked off a road near Spalding Drive and Happy Hollow Road in Sandy Springs. A basecamp was set up nearby on Holcomb Bridge Road. On December 1, filming moved downtown, using the old Norfolk Southern building. Crews also worked in Doraville on the 12th at Third Rail Studios. 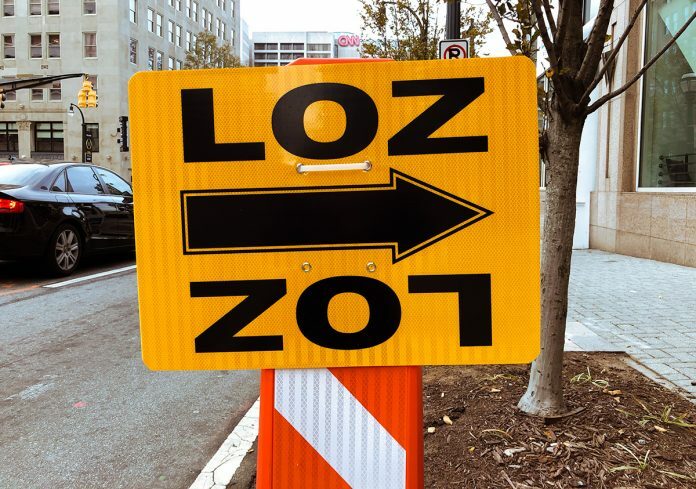 Netflix’s Ozark (BRYDE/SUGARWOOD/BCP) is filming its second season, and as you can see, this one’s using multiple signs. The Jason Bateman series was spotted at Van Pugh North Park on Lake Lanier from the end of November and into early December. Signs were spotted on Peachtree Street and Ponce De Leon Avenue on the 13th, aiming toward the nearby Georgian Terrace hotel. Crews moved out to Douglasville on December 15, and up to Lawrenceville on the 18th. NBC’s Good Girls (GOOD GIRLS), a series about three suburban women pulling off a heist after falling on hard times, was spotted between December 3 and 8 in Clarkston. On December 14, production moved to Midtown. Signs were spotted on the 17th along Cascade Road near Benjamin E Mays Drive and Lynhurst Drive. Good Girls stars Christina Hendricks, Retta, and Mae Whitman. Also seen this month: CBS’s MacGyver (EYE) had signs along Howell Mill Road on December 18. YouTube’s Karate Kid spinoff sequel series Cobra Kai (CK) was in Marietta between December 7 and 10 and in Conyers on the 16th. BET’s The Quad (GAMU) had signs up on Joseph E Lowery Boulevard and Lucille Avenue on the 1st and on Spring Street downtown on the 14th. The to-be-titled Avengers 4 (FIGARO) posted signs leading toward Pinewood Atlanta Studios early in the month and set up a basecamp at Hartsfield-Jackson Atlanta International Airport on December 8. FOX’s X-Men series, The Gifted (HVN) shot in Northwest Atlanta on December 11. AMC’s new series Lodge 49 (LODGE 49) was in Decatur between December 8 and the 11. The final season of the CW’s The Originals (TOGS) filmed in Covington on November 28. The final shots of the series were captured between December 11 and 12 in Conyers. Another CW series, Dynasty (CROSSEYE), shot in Midtown on November 28. Finally, Jack Black’s The House with the Clock in its Walls (BVP) was in Newnan on December 12. And lastly this month, with the holidays fast approaching, there’s one long-held tradition that never gets old. After you’ve trimmed the tree, opened the presents, and stuffed yourself with Christmas dinner, there’s nothing better than heading to the movie theater. (Possibly because its one of the few things that are open and you’d rather not discuss politics with your family.) Thankfully, there are a few Georgia-filmed (or at least partially Georgia-filmed) movies to choose from. First, there’s Jumanji: Welcome to the Jungle. Most of this one filmed in Hawaii, you know, in the jungle, but there’s still a portion that was shot locally. Or you could choose Pitch Perfect 3. This one’s all local, so expect to play guess-the-location. (The Georgia Aquarium will be very easy to spot.) Technically Thor: Ragnarok shot in Australia, but a few reshoots were done at Pinewood Studios Atlanta. While that may seem like a stretch to include on this list, we’re going to count that one simply because it leads directly into the upcoming locally-shot Avengers: Infinity War. And if movies really aren’t your thing during the holidays, why not catch up one of the many locally produced television shows? It’s the perfect time to binge The Walking Dead, Stranger Things, Ozark, or Halt and Catch Fire—all of which are on Netflix. Happy holidays!